"One way" is the way to go! We spend a full six days travelling in one direction only through Gwaii Haanas National Park & Haida Heritage Site, either southbound from Cumshewa Inlet to SGaang Gwaay or northbound from SGaang Gwaay to Cumshewa Inlet. Each trip will either begin or end with a spectacular seaplane flight over Gwaii Haanas from Queen Charlotte City to (or from) the M.V. Island Bay. Logistically speaking, it doesn't get any better. Besides giving you an interesting aerial perspective of one of Canada's most spectacular National Parks, it also provides us with the luxury of a relaxed 'one-way’ only trip through the Gwaii Haanas. Enjoy a great "flight seeing" experience through the beautiful southern Charlottes. You'll begin or end your trip with a flight on an Inland Air Charters DeHavilland DFC-“Beaver" aircraft. From the air you'll get a stunning birds eye view of this spectacular archipelago. The pilot will be able to describe the physical features of Gwaii Haanas giving you a completely different sense of the landscape than that experienced while traveling by boat. Less actual travel time on the "mothership". Not that travel in the Island Bay is unpleasant - au contraire, it's a great opportunity to read, relax with friends, enjoy meals, watch birds, sea mammals and the sea and land 'scapes' as we journey along. Six days however, is not a long time and Gwaii Haanas National Park encompasses a huge area. Even traveling ‘one way only’ through the park involves covering roughly 136 nautical miles. At approximately 7.5 nautical miles per hour this translates to 18 hours spent running in the mothership - about three hours per day on average. This gives us a lot more time for paddling, exploring ashore, hiking or just relaxing. A greater comfort and safety margin for transiting the few exposed headlands that we must get by at some point in the trip. More time in the southern portion of Gwaii Haanas. Minimizing the cruising portion of the trip to approximately eighteen hours allows significantly more time to be spent in the more remote, rugged and spectacular southern part of the Park. Maximizes every other dollar that you've spent pulling this trip together. The average cost of an air ticket Vancouver to Sandspit is approximately $500.00 (CDN). Charter fees, taxes, Parks Canada User Fees are not cheap either. 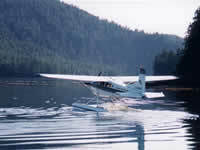 The extra cost of flying either in or out of Gwaii Haanas National Park Reserve is approximately $200.00 CDN per person. Flying adds an additional 10% to the cost of the trip but maximizes the value of all of the other expenditures that you've made. Accessing the park by air will give you the best possible full six-day trip into this spectacular area. Period. For years now I've been offering what I hope was a great trip into this unique area. I’ve come to realize that for a few more dollars I can now offer, logistically speaking, the best trip possible. You'll travel with a very small group of five or six people for a full six days in Gwaii Haanas National Park. Running time in the mothership will be minimal. Time for kayaking, hiking, exploring village sites, etc. will be maximized. Adverse sea conditions become much less of a safety and comfort factor as there are fewer exposed headlands to negotiate during the course of your trip. By reducing the cruising portion of the trip to approximately eighteen hours, we are able to spend significantly more time in the more remote, rugged and spectacular southern part of the Park. And to top it off. You experience a spectacular “flight seeing” overview of one of Canada's national treasures. In previous years, I've tried to visit all five of the village sites, which are manned by local Haida Gwaii Watchmen (and women!). Although they’re all spectacular places peopled by friendly, interesting and informative 'Watchmen', I've found that I’ve had to make tough choices in order to allow more time for kayaking and exploring other aspects of Gwaii Haanas. Next year we'll visit T’aanuu, Hotsprings Island and SGaang Gwaay. We may stop at Skedans village and Windy Bay village sites if weather permits.